QUALITY: The cold opening NAILS the diversity problem on the head, quicker then even I expected when Kerry Washington was first announced as a host. Ballsy. QUALITY: Yes, Kerry Washington is as infinitely likable a host as you might hope. PROBLEMATIC: Throwing to a room full of Matthew McConaheys before bringing out Rev. Al Sharpton, ESPECIALLY Sharpton, felt as half-written as possible. I get why you wanted to do this cold opening, but I haaate under-planned endings. They’re something SNL has gotten much better at NOT doing. QUALITY: Still, it’s GOOD to have someone finally playing the First Lady of the United States when you realize the INFINITE time given to Hillary Clinton (and her many iterations) this season. QUALITY: Nasim spotlight sketch! What can I say, I was infinitely amused by the over abundance of sound effects and pelvic thrusts in the service of motivational speaking, even if the live crowd didn’t sound entirely sold on the weirdness of Career Week. PROBLEMATIC: Mike O’Brien is the worst cast member at this thing called character acting. Still, does that make his every appearance something QUALITY? Weeeell, we aren’t there yet. QUALITY: That’s right, you tell ‘em how silly it is for people to read recaps on shows they just watched. Pffft, white people. That’s like being part of a fantasy football league, as if WATCHING football ain’t entertaining enough you’ve got to add MATH! Hey… wait… NO ONE PAY ATTENTION TO THIS! QUALITY: Seriously the only thing I’ve noticed so far, is how much Kerry Washington’s appearance has put a spotlight on the PROBLEMATIC fact that strong black female presence would add to the show SO NICELY. PROBLEMATIC: Then again, if the diversity door stays open, we’ll have to talk about the fact that Nasim Pedrad is as Asian as SNL has ever been. PROBLEMATIC: Christian Laettner, we need to talk about you being a part of the 1992 Dream Team. It makes less sense 20 years later. QUALITY: CONGRATS to THE FIVE-TIMERS CLUB! Honestly, Leah had the first pick and she used it well. Even though Lady Gaga hadn’t been officially announced, she’s been rumored since Tina, Miley, and Bruce got the nod to begin the season! I think the Miley nod had us all weary that it was going to happen, not to mention the Lady Gaga Talk Show during the WILLIS episode. We won’t even get into the fact that Miley and Katy Perry feel infinitely more relevant then Gaga lately, but SNL hosts come in all phases… should be an interesting episode. And after that announcement it was back to our usual success in predicting. PROBLEMATIC: She certainly sells her cocaine fueled appearance like a CHAMP, but Kate McKinnon as your go to Latin American cast member is like casting Fred Armisan as Barack Obama! QUALITY: You’re livin’ the dream, McKinnon! QUALITY: RICK RUBIN IS ON SNL! Seriously, when does this crazy wizard get to Host? PROBLEMATIC: I loved seeing Rick Rubin up there, LOVED the set-up, and I quite enjoy “Berzerk” as a song, but something was consistently lacking in Eminem’s performance. For such a HYPE song, he was half there for it. I’m THIS close to calling an Ashlee Simpson on the first song. QUALITY: I appreciated it when Cecily Strong was so surprised by the boisterous laughter of That One Guy, that she just HAD to say something. QUALITY: Calling out how long it took to rehearse a cheap gag, Seth? You’re practicing for Late Night already! Conan would be proud! Jimmy, however, is so much more professional then that. PROBLEMATIC: Jason Segal, you know when your lack of shirt was the punch line AFTER Nickleback tickets… hey wait, you got skinny, son! PROBLEMATIC: Gaaah, what IS eating New York City’s rats?! QUALITY: That Kanye joke, Ms. Strong? Delicious. Go on, BASK in that applause. QUALITY: “You don’t look at anything except the tip of your nose.” Sometimes it’s the simple things that’re the funniest. Keep crossing them eyes, Jay! PROBLEMATIC: What are you doing NOT fist-pumping Cecily Strong?! For shame for leaving her hanging, ffffor shame! QUALITY: Classy move, with the memorial clip for Lou Reed. PROBLEMATIC: Phew, and you TRIED to sell that sketch didn’t you Aidy? PROBLEMATIC: Does it look like Eminem is reading off of cue cards because he’s playing to the front row? QUALITY: I appreciate that Eminem came to town with the intense rock-fueled one-two punch of songs, even if meant I didn't get the second song right. QUALITY: It may have been in garbage time, but there was just something about the transparent delivery/complete insanity that had me laughing the most. PROBLEMATIC: We get it Eminem you don’t smile. But if you’re going to show THAT level of enthusiasm join Brooks in the back. At least HE’S smiling now! QUALITY: Washington may have hugged J-Faux first, but she somehow was lucky to find McKinnon right after! He living the dream! A quiet week for the featured cast, as Noel Wells did maybe the most work, other then Mike O'Brien, even if the points don't show it. Good Neighbors is still giving Bennett and Mooney a late show outlet. Jay Pharoah had his busiest show so far this season. There's something to be said for being the cast member matched with the host for that boyfriend/girlfriend spot. We saw Killam get a big boost in the Mily Cyrus episode thanks to this. MUSICAL GUEST - Eminem - SONGS: No songs chosen. The standings have tightened up, and as they do we'll have to hold our breaths an EXTRA WEEK as Lady Gaga hosts a brand-new episode on the 16th of November! The Five Timers Club won't be at eighth place for much longer, as we get to see what kind of impact a Host can make on a team! AND she's her own musical guest, so enjoy the costume changes! 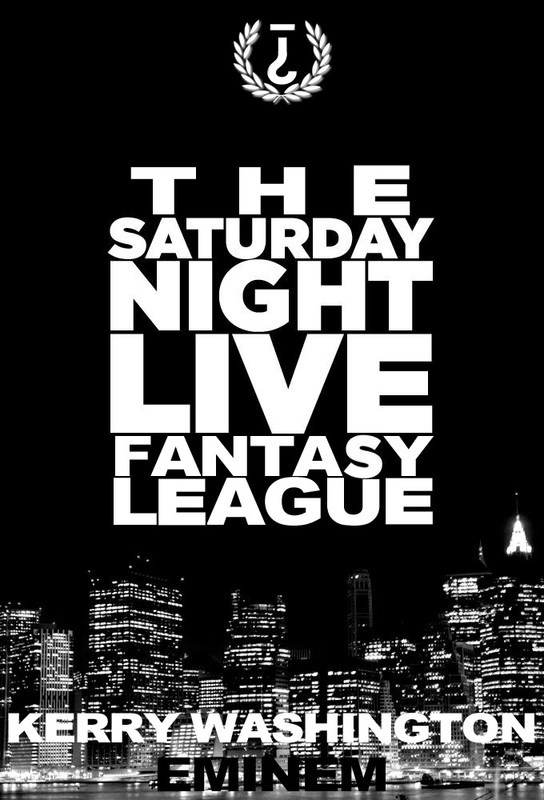 So we'll see you in TWO WEEKS you SNL Fantasy Leaguers, but until then... see you at Trivia Club!